If you are a fan of Thai food, you probably will want to check this out....Boat Noodle has introduced new additions to their menu – a total of more than 9 offerings that are a real treat for people of all ages regardless day and time! 1) Thai Popeye’s Tempura – a light snack which features fresh fried spinach that is cooked in crisp and coupled with a piquant “Soot-Yot” dip. Soot Yot in Thai simply means awesome. 2) Yum Mama – the classic Thai instant noodles smothered with slices of chicken sausage, crab stick and greenies. 3) Yum Woon Sen – A must-try dish for seafood lovers who dare to take spicy food! Topped with bouncy shrimp and crab sticks, Woon Sen or locally known as Vermicelli is set to give an extra kick of flavors to the diners. 6) Bangkok Omelet with “Sood Yut” – as the name implies, hunger pangs can have their tummy filled with this wholesome meal. 7) Kra-Pow Chicken Rice – Kra Pow in Thai refers to Thai Basil Leaf. 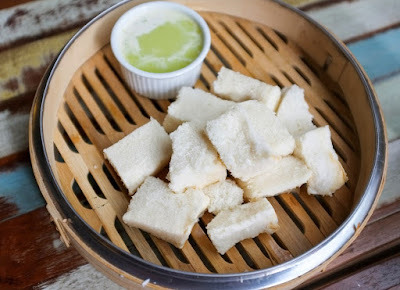 It is one of the common street food in Thailand that always win the heart of many. 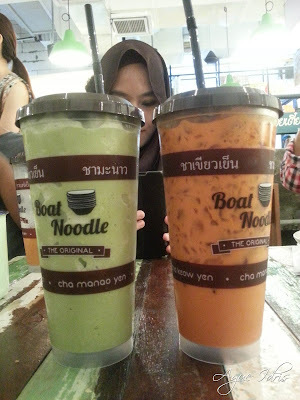 Boat Noodle has also expanded its beverage list with the thick and creamy Ice-Blended Green Tea and refreshing Ice-Blended Coconut which you absolutely should try. The menu of Boat Noodle does not limit to just glass noodle but diners can now opt for rice selection as well as the original Thai noodle. Boat Noodle wants to be “the” place for anyone when they start to miss those street food in Bangkok; hence, all Boat Noodle outlets portrays a Thai street market facade, comprising signages in Thai and vintage knick-knacks, which enable diners to fully experience and explore Thailand’s street market nostalgia locally. Boat noodle is a Thai street-food staple originally hawked from small boats on the canals of central Thailand. The Original Boat Noodle has indeed got Malaysians buzzing, after marking its first footprint in Empire Damansara. Up-to-date, Boat Noodle has nine outlets in Malaysia, which are strategically located at Empire Damansara, The School at Jaya One, Ikon Cheras, Berjaya Time Square, Publika, Sutera Mall at Johor Bahru, Gamuda Walk at Kota Kemuning, Klang Parade and D’Pulze Cyberjaya.